If you are not thoughtfully planning your future material handling and storage equipment purchases, you’re putting yourself at risk of investing in equipment that is less than optimal. It is very important to take your specific needs into consideration, so you can learn what your options are to meet your requirements. Because there are many choices an experienced material handling professional is invaluable to helping you walk through that process of sorting through your options to optimize your workspace. When it comes time to invest you want to know you are purchasing the most appropriate equipment for your business. With decades of experience, Cranston Material Handling can help you with these considerations. We will work with you to plan for a better future by evaluating your facility and helping you determine how to utilize your space better, increase your efficiency, and improve worker safety. Having a poor warehouse layout can hold your business back from increases in efficiency in your operations. It is crucial to assess the flow of material in your warehouse, reduce travel distances, and properly size your warehouse racks based on the size and weights of the material being stored. Also, if critical areas of your operation lack adequate storage space, your operations are not functioning efficiently. But how do you squeeze more storage into an already crowded area? At Cranston Material Handling, we have extensive experience in warehouse layout and storage rack design. We will work with you to evaluate your current space and help you design a new layout or redesign your existing storage area to increase the efficiency of your operations. Another important and often overlooked safety practice are pallet rack inspections. Your employees are always working around the racking system, and it is being used to store your valuable products, so it is crucial to ensure the racking is maintained correctly. When your pallet racking is not maintained correctly, you risk injuring employees and damaging valuable material. A lack of maintenance to your racking system will also significantly increase the liability of your business. If an accident occurs due to structural deficiencies, usually due to normal wear and tear, your company could be held liable for leaving an unsafe working condition go unresolved. A pallet rack inspection is the only way to ensure that your pallet racking system is structurally sound and safe for use. 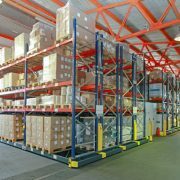 At Cranston Material Handling, we can perform a thorough inspection of your pallet rack to determine if your rack is structurally sound, if the pallets are positioned correctly, and if the safety components are present and properly engaged. We will put our findings into a detailed report and will make recommendations for repair, replacement or another appropriate corrective measure. Commonly, warehouses that are dirty are also the most inefficiently run. Facilities like this are easy to spot with broken pallet boards and shrink wrap film littered throughout the warehouse. It’s common for light fixtures to be out of order and most surfaces are covered in a thick film of dust or dirt. This lack of housekeeping not only creates safety risks, but it also creates an employee culture where they don’t take pride in their work. Although poor housekeeping causes a variety of issues, it is a mistake that can be easily fixed. Plan out designated cleaning time for each shift, at the start or the end of the shift. By encouraging a cleaner workplace, employees will have more pride in their place of work, leading to better work performance and higher employee retention rates. It’s not bad luck when something breaks down in your warehouse facility. Many times, equipment failure is due to a lack of preventative maintenance. As a business owner, you are spending your hard-earned money on fork trucks, packaging, and material handling equipment, so it is important to put a plan in place to protect your investments with preventative maintenance. In the long run, frequent interruptions to your operations due to equipment failure will cost more than paying for regular maintenance services, so it is important to consider hiring an outside maintenance service provider or hiring an in-house dedicated maintenance team for your facility. When a worker is injured, their job performance will suffer. If your company is cutting corners or looking the other way while workplace safety is being compromised, you could be making a very costly mistake. With worker compensation claims and OSHA fines, you could face some significant costs for lack of proper safety practices. In the long run, employees working in an unsafe environment will work slower, becoming less efficient. This can take a toll on operations and can also lead to higher overall costs. Many employers today are faced with employee turnover. With the significant costs that come with an employee leaving the company, it is important to find a way to reduce this turnover through staff development and training. In many cases, an employee leaves a company because they didn’t feel they received the proper amount of training and development opportunities within their position. Aside from employee turnover, lack of training can have other detrimental effects on your company. When an employee has received little training, they will be more prone to mistakes, which can lead to reduced quality and increased inefficiency. It is essential to provide your employees with a detailed training plan for each position and to provide each employee with a career development plan for their specific position to help with retention and quality of work. Don’t let your pallet racking become a safety risk, call Cranston Material Handling today to schedule your pallet rack inspection!